He was the most feared yet respected fighter pilots of World War I until his death in 1918: the Red Baron. He and his squadron, the Flying Circus, made life miserable for British and French fighters in the skies above the battlefields. On Saturday, Sept. 8, during the Bluebonnet AirShow, the distinct red and black plane returns to do battle over the Highland Lakes. 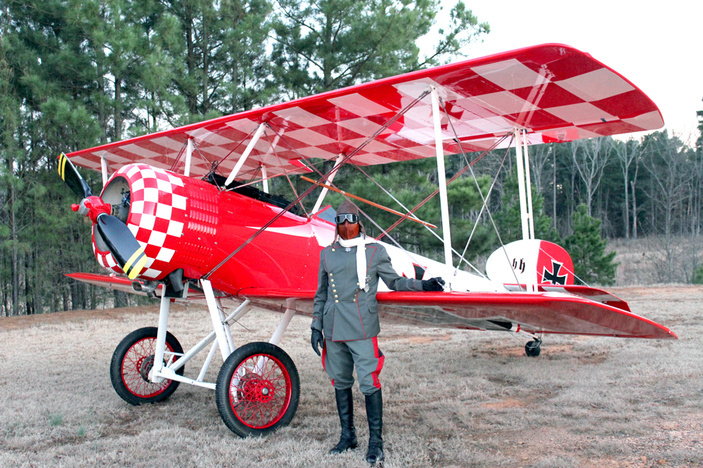 This isn’t the original German fighter pilot; it’s the Immortal Red Baron, a man who, according to the storyline, discovered the Red Baron’s plane in a barn. Though the audience connection is through the character, the Immortal Red Baron isn’t the hero of the story. The Bluebonnet AirShow, hosted by the Highland Lakes Squadron of the Commemorative Air Force, is Saturday, Sept. 8, at Kate Craddock Field, 2302 U.S. 281 South in Burnet. Gates open at 9 a.m. The planes take to the sky from 1-4 p.m. Tickets are $20 for general admission, $10 for ages 60 and older as well as military members with IDs, $5 for ages 6-17, and free for ages 5 and younger. Tickets and more information are available at bluebonnetairshow.com. Go to immortalredbaron.com for more on the Immortal Red Baron portion of the program.